With ample user code space and the newly enhanced real-time VCL 2.0 programming language, OEMs can use Model 1351 to develop a wide range of vehicle and system control applications as the master or a slave in a multi- module installation. The 1351 System Controller was designed for a wide variety of applications, such as material handling vehicle masters, base controllers for aerial trucks, operator interface in man-up platforms, land based installation controllers replacing PLCs, ICE and Hybrid system controllers, hydraulic manifold control and many others. 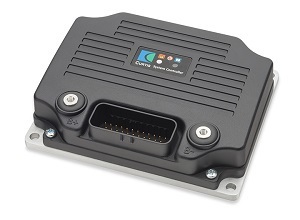 This advanced controller features highly flexible I/O as pins are multifunctional and easily configured to match any application, and with the Curtis Vehicle Control Language (VCL), an easy to program “C-like” language providing all the power and flexibility to control any application. VCL programs run protected and securely; monitored for proper operation to protect the system from erratic behaviours. Model 1351 provides speed, safety and simplicity with dual 32-bit microprocessors to achieve powerful performance and safety. The microprocessors cross check each-other continuously for proper operation to ensure reliable control of your application. 1351 can perform user developed Safety Functions to EN13849 Category 2 PL=d and limited Category 3 functions using the I/O redundancy and built-in SRDO functions. This system controller also features comprehensive CANbus control. With two Independent CAN ports, Model 1351 offers a wide range of connectivity options. Each port can run different rates and protocols, with full CANopen and/or J1939 compatibility. Model 1351 is ideally suited for hybrid vehicles or to bridge CANopen ports at different bit rates.